Today’s AM fix was USD 1,578.00, EUR 1,214.13 and GBP 1,049.06 per ounce. Friday’s AM fix was USD 1,570.00, EUR 1,203.99 and GBP 1,043.74 per ounce. Silver is trading at $28.75/oz, €22.11/oz and £19.20/oz. Platinum is trading at $1,584.25/oz, palladium at $719.00/oz and rhodium at $1,200/oz. Gold fell $4.80 or 0.,31%% on Friday in New York and closed at $1,575.60/oz. Silver surged to a high of $28.77 in early New York trade before it also fell back off, finishing with a gain of 0.28%. Gold was off 0.31% for the week while silver was down 0.66%. 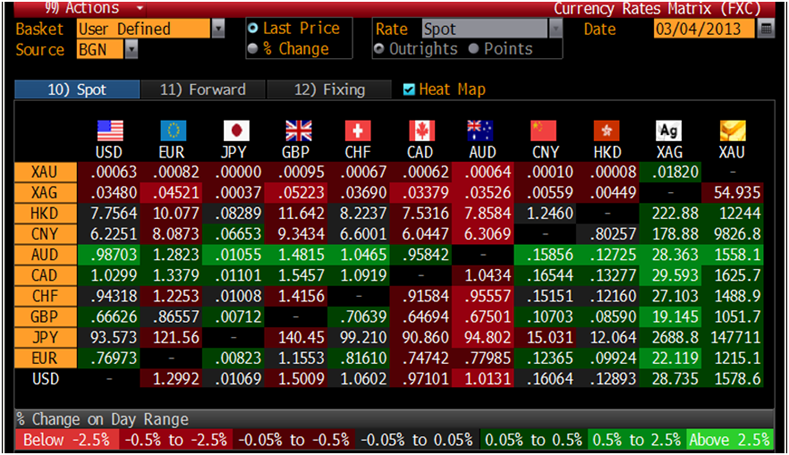 Gold inched higher in all currencies today supported by physical buying in Asia. Concerns about the global economy and the outlook for riskier assets have led to renewed physical buying interest in Asia, particularly in China. The increasingly popular gold forward contract on the Shanghai Gold Exchange stood at 320 yuan a gram by 0741 GMT according to Reuters, or $1,600/oz. This is a healthy premium of about $23 to spot gold. Investors are waiting to see the impact of the spending cuts, known as the "sequester", although the $85 billion cuts are a tiny fraction of the U.S. government's total spending of $3.7 trillion and show the U.S. looks incapable of tacking its very precarious financial position. Hedge funds and money managers increased their net long positions in gold in the week to February 26 from a more than four-year low hit a week earlier. Those lows are very bullish from a contrarian perspective and a gradual increase in speculative longs in the coming weeks seems very likely. In contrast to a sharp decline in speculative interest in futures and options over the past month, sales of American Eagle gold coins rose sharply in February on the year, and silver coin sales in the form of one ounce Silver Eagles posted their strongest performance for the month since 1986. China’s foreign currency reserves have surged more than 700% since 2004 and are now enough to buy every central bank’s official gold supply -- twice. The Bloomberg CHART OF THE DAY shows how China’s foreign reserves surpassed the value of all official bullion holdings in January 2004 and rose to $3.3 trillion at the end of 2012. The price of gold has failed to keep pace with the surge in the value of Chinese and global foreign exchange holdings. Gold has increased just 263% from 2004 through to February 28, with the registered volume little changed, according to data based on International Monetary Fund and World Gold Council figures. By comparison, China’s reserves rose 721% through 2012, while the combined total among Brazil, Russia and India rose about 400% to $1.1 trillion. Continuing diversification into gold from the huge foreign exchange reserves by the People’s Bank of China and other central banks is a primary pillar which will support gold and should contribute to higher prices in the coming years.